Timber Roof trusses can be pre-fabricated and can be designed in many shapes and sizes. They are a good alternative to conventional timber roof framing with rafters etc., as they can span great distances, can be quicker to construct, and allow in most domestic building cases for the internal walls to be non load bearing. Although roof trusses are good in many projects, sometimes conventional framing is still required to build the roof as intended, even if it is framed over roof trusses themselves. As a designer, it is good to know what can be achieved with timber roof trusses. Below I have some of the different types of roof truss designs that can be implemented. If you have a design idea with trusses that isn't conventional, it is good to speak to a truss manufacturer to see if it can be constructed. Here are the basic names of the components/members of a timber roof truss. Most basic timber roof trusses timber dimensions are 90x35mm and start at strength grade MGP10 (old grading called F5). If the truss requires a bigger timber size due to the load it is to carry, the bigger size is usually applied to the bottom chord first, leaving the top chord and webs at 90x35mm. This too can change but usually isn't necessary in most cases. Roof trusses can also be designed to have bigger sizes on all the members of the truss too if required. This is often the case when having exposed roof trusses as a design feature. Using the standard 90x35mm looks a bit flimsy so using bigger sizes adds to the aesthetics. It can also be required where the roof truss is supported on its overhang, and not on its bottom chord. Roof truss members are fixed together with nail plates. These are specially designed perforated sheet metal that have an engineered twist in the sharp parts of the metal that have been pressed out of the sheet. Nail plates come in different sizes that will be determined by the roof truss manufacturer. Standard Roof Truss - This is the most common type of roof truss there is. It is used in both gable and hip and valley roofs among others. It can have overhangs or no overhangs. 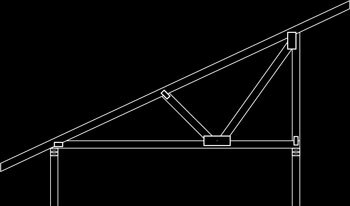 Mono Roof Truss - A half of a standard truss. The difference with the mono truss is that it can also have a top chord offset extension/overhang. Scissor Roof Truss - Similar to a standard truss except that this truss has an external roof pitch and an internal roof pitch. I find that having the internal pitch no greater than half the external pitch works ok in most cases. E.g 30 degree external roof pitch, no greater than 15 degree internal roof pitch. 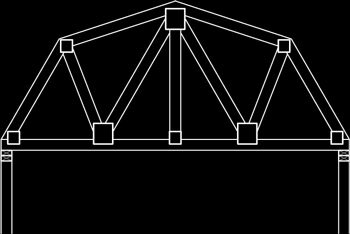 Parallell Chord Truss - This truss is basically a big rectangle. Good for long open spaces. It can have top and bottom chord extensions or not. Attic Roof Truss - A framed type of truss except that there is a void in the middle of the truss for a room. 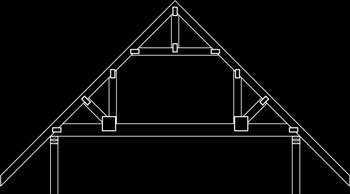 I have found that these trusses work best with a pitch of 45 degrees or greater to alow enough room for head space. It is also a good idea to tell the truss manufacturer if you intend to install or store anything heavy on the attic truss, so they can take that into account in the design of the truss members and size and grade them accordingly. Bowstring Roof Truss - This truss is made up of many small sections of top chords to form the shape of a curve. It isn't exactly curved, just segmented enough to allow for the roofing to create the smooth curved finish. It can have bottom chord extensions or not. Gambrel Roof Truss - This truss has 2 pitches. It is often seen in barn building construction. Doesn't have an overhang usually although may be able to be designed with one. Bell Roof Truss - This truss also has 2 pitches.